Finally Magic Leap has given us enough information we need to start developing apps and games for the Augmented Reality world. 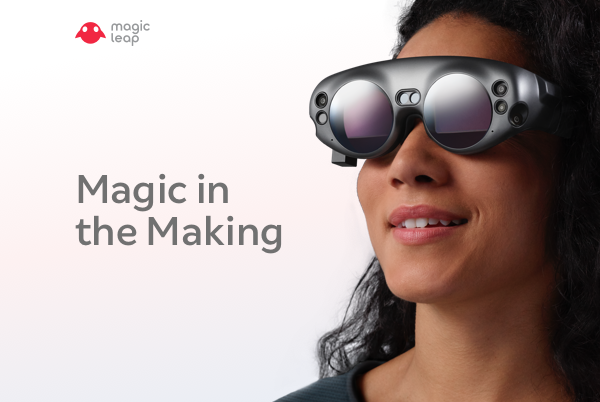 The first creator device is called Magic Leap One. At appsFresh.com we’re very excited about it because we have had the chance to experience it already and we know this is the future that we want to be part of. Component A is named Lightwear. It is the screen part of the Magic Leap One device. It’s the centerpiece of the device. It allows the wearer to use the device for hours straight without feeling overwhelmed by motion sickness and it’s light weight prevents your head from feeling too hot which would force you to want to take the device off your head to cool off. The Lightwear headset also does environment mapping which means it is aware of objects around you and where you stand, as well as we’re you’re moving to. (jumping too). The Lightwear piece also has a Soundfield audio component which plays sounds in a way that makes you understand where objects are located as well as in which direction they are moving towards. Do not be fooled by the small size of this device. It will replace your computer monitors with full high definition. That’s right, you can have as many screens as you wish, wherever you wish them to be located at. You’ll be able to lock the screen position or have it follow your head movements. Say Hello to having your own portable IMAX movie theater ! Component B is called the “control” (surprisingly no fancy terminology here!). The control has 6 degrees of freedom, which in simple English means it can understand all your moves in the real world, up down, left right, forward backward, and rotations. By the way, the Lightwear environment mapping will track the control which means you’ll be able to see exactly what your hands are doing. Unfortunately, you hands are doomed to be stuck to the control, which means you don’t really have total freedom of action like you’d expect in a perfect virtual world.